Having learned the whole alphabet already, we are now going to think about things that will make our letters really beautiful. For each of you we’ll be working on different improvements to letters, but here are a couple for everyone…. When we write our handwriting, it’s fast. Of course. It’s about getting the message/thought on paper quickly. 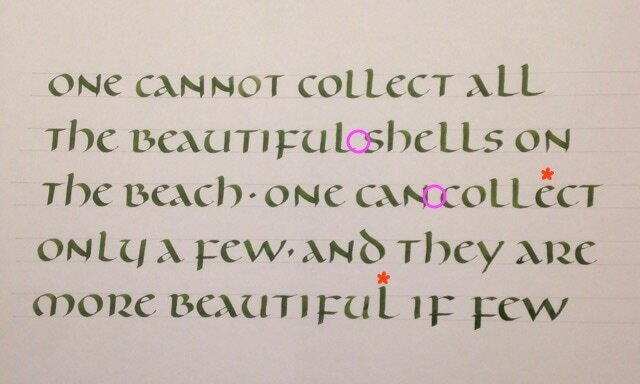 But calligraphy is very rarely fast – even those styles of lettering that look fast, probably weren’t. So make sure you take your time – think about both corners of the nib, think about the black line you’re making and the white shapes you’re making … and enjoy it! Most of us, as well as writing quickly, write heavily on the page. This is partly because our most common writing tool, the ballpoint, needs a heavy hand to get it started. For calligraphy this is a bad habit – it’s desirable to think about the pen just gliding over the paper depositing ink as it goes – this way you’ll get the most flowing letters. If you believe your pen needs pressure then I’d say there’s probably something not right with the pen! So… rule up a couple of lines at 4 nib widths, fill your pen, and rewrite one of the pangrams you chose for lesson 3, moving the pen slowly and thinking about the “touch” of the pen on the paper. If you can lighten your touch the lettering should feel easier AND they’ll look better. We’re pretty good at judging letter spacing – if you think the spacing is too tight or too loose then you’re almost certainly right. We are aiming to get even spacing through the lettering – this is NOT making all the letters the same distance from each other. Two curved letters will be closer together (e.g. HE in the example) than 2 straight edged letters (e.g. IF in the example). Some of the letters are “greedy” with space – such as the A. To stop the space around these letters looking too big, the adjacent letters need to be very close – maybe even just touching – especially the combination EA. The reader only needs a little clue that there is a word gap – try leaving a gap which is not quite big enough for an O – the O would touch both the words if we squashed it in. See the pink circles on the picture. This is not a strict rule, but will work successfully and avoid letters crashing into each other. So armed with all this information about spacing, choose a short poem (4 lines or so) and write it out. To improve as a calligrapher you need to be able to look, see what could be improved, how it could be improved, then do it again, but better. So grab a pencil and find 5 things (no more) that could be better. This could be letter shapes, spacing, or layout on the page. Underline them and write a note for what you think is wrong. Now write the poem again, having taken your own comments on board. Do please submit both the “before” (with comments) and the “after” piece to me, with any information that might help me know how it’s going.